I’ve interviewed writer and award winning filmmaker, Magda Olchawska. Just click on the Interviews Menu option above for the full interview. I went to Waterstones Chiswick branch to sign a few copies of The Banker. The staff mentioned the possibility of staging an event featuring local crime/thriller authors. I launched a giveaway on librarything a few days ago. I’m offering 10 ebook copies and the offer closes on 7th April. The giveaway seems to have caused a surge in my kindle ranking. It moved from about 130,000 to 28,000 before falling back to 60,000. Today I started work on my second novel. The book will be a thriller with an alternative history context and retrograde amnesia (long term memory loss) playing an important part. Apart from a 500 word synopsis I haven’t written anything yet. I’ll write more about the synopsis in a future post. At the moment I’m working on the plot and planning some research into amnesia. The Long Kiss Goodnight – a 1996 movie starring Geena Davis depicting retrograde amnesia. Memento – a 2000 movie starring Guy Pearce. Experts regard this as an excellent description of anterograde amnesia (short term memory loss). 50 first dates – a 2004 movie starring Drew Barrymore. Depicts anterograde amnesia. My book will deal with retrograde amnesia so only the first movie is relevant, but I’ll try to see them all anyway. If readers of this blog know of other movies or books dealing with this subject, please do let me know. This is a very funny black comedy. The film starts with two couples, Penelope and Michael and Nancy and Alan reasonably amicably discussing a fight between their respective school-age sons. Penelope (played by Jodie Foster ) is an earnest, humourless writer married to working-class salesman, Michael(played by John C. Reilly). Alan (played by Christoph Waltz) is a corporate lawyer married to broker Nancy (played by Kate Winslet). Just as Nancy and Alan are about to leave the apartment a chance remark draws them back in. In fact they almost leave on two more occasions. The polite masks soon fall away and the arguments get increasingly nasty. At first the rows are between the couples; this degenerates into a free for all. There are some very funny one-liners and put-downs. I thought by far the stronger performances were from Jodie Foster and Christoph Waltz. 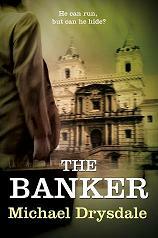 My Goodreads Giveway of The Banker ended yesterday. 2 winners, one in Canada the other in the US, will be receiving their copies shortly. On the day the Giveaway started my Amazon Kindle rank reached 11,400 before falling away to its normal ranking of 80,000 or so. Then yesterday (the last Giveaway day) it popped back up to around 20,000. My spot the director competition is still on – closing date is 6th March.